I love Grenache however it is known. Garnacha in Spain, called Cannonau in Sardinia. And wherever it’s from: France, Spain, Italy, California, Australia - I’ve enjoyed them. Prices for cult unblended varietals and Grenache-blended Châteauneuf-du-Pape can exceed $600 per bottle. But I can’t tell you anything about those because I’ve never had one. What I generally enjoy are wines from $15-$50. “Enjoy” being a relative term and understood to mean some more than others. What I can say, definitively, is that at $12.99, I have enjoyed no Grenache more than Tres Picos. Bodegas Borsao is in the Campo De Borja, a D.O. (Denominacion de Origin) in the province of Zaragoza, Aragon in northeastern Spain. Written records about winemaking in this region date back to 1203. Grapes are grown on bush-trained vines averaging 35 – 60 years of age (with some dating back to the 1920s) on stony clay and limestone soil on the slopes of the Moncayo Mountains at elevations of 600 – 700 meters (1969 – 2297 ft.). Garnacha (Grenache) was the red wine grape of Spain, and even in the late 20th century was the second most planted world-wide. But with the European Union’s pull scheme, by 2010, Garnacha had fallen to 7th place (4th in Spain after Airen, Tempranillo and Bobal). With Airen being a white wine grape for bulk and blending use, Tempranillo became the new king of Spanish red and has been received well internationally. By some tastes, Tempranillo is less rustic. And while I respect that all palates are personal, I just can’t imagine Tempranillo being used as a blend in Chateauneuf-du-Pape. There’s room for Garnacha. When I’m posed with the dilemma of being marooned on an island and asked what one varietal I would chose, I answer “water”. Pity our world should our choices ever be limited to just a few grapes that corporate behemoths have analyzed as the most cost effective to utilize. Medium bodied wine, Tres Picos is 100% Garnacha and bursting with cherry from the glass. Floral notes join aroma of red berries on the nose. The cherry carries from the nose onto the palate with tastes of licorice, blackberry and plum with hints of leather, though cherry (for me) is dominant. The wine is silky textured with soft tannins, juicy but made complex with garrigue and spice. A slight smoky minerality adds to the enjoyment. This is not intervention wine. Juice is aged in tank and neutral French oak for ten months. This is wine that begins in the farm on old vines properly managed for low yields (less than two tons per acre) and sited in the best areas. 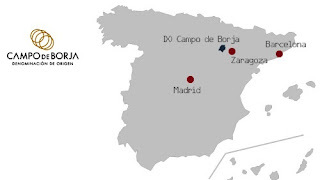 Tres Picos means “Three Peaks.” And I’d have to say if Quality, Value and Price were the three peaks of smart wine buying, Bodegas Borsa has achieved the summit. Follow and like Wine Mizer on Facebook for industry news, pairing suggestions and mini reviews. Imported by: Atlas Imports LLC, Chicago IL. Not a one-hit wonder, Tres Picos has a history of high scores with Parker assigning 91 points to its 2015, 90 for the 2013 and 92 for the 2012 vintage. With an ARP of $17, an amazing value. Pairing: Just about any red meat, beef or lamb. A grilled hanger steak, barbecued or not. Crostini with trimmed pieces of short rib, Cambozola cheese and cherry jam.